For times when you don’t have access to your copy of Nikon D7500 For Dummies, this Cheat Sheet offers a handy reference guide. It offers a map to the camera’s exterior controls along with basic information about exposure modes and the functions played by each button, dial, and switch. 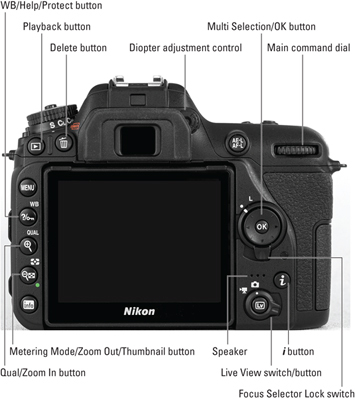 If you’re not familiar with the Nikon D7500 camera, here’s a quick guide to its buttons, dials, and other external controls. The lens shown here is the 18–140mm kit lens; other lenses may have different features. See the next section of the Cheat Sheet for information about what the main buttons do. It’s great to have a map to the buttons and controls on your camera, but it’s not a lot of help if you can’t remember which button to press when (and why). So here’s a look at the functions of the most important controls. (Some controls have additional functions during certain operations, but the table lists the ones you’ll use most often.) Note: This information concentrates on features available when you shoot in the P, S, A, and M exposure modes. A few controls also work in other modes. This control . . . performs these functions. Mode dial Sets the exposure mode, which determines how much control you have over picture settings. For the most control, choose P, S, A, or M. Press the unlock button on top of the dial before rotating. Release Mode dial Use to select shutter-release mode (single frame, continuous, self-timer, and so on); press the unlock button next to the dial before rotating. Movie-record button After putting the camera into Movie mode and engaging Live View, press to start and stop recording. ISO button Press to access the ISO setting, which affects the camera’s sensitivity to light. Exposure Compensation button Press while rotating the Main command dial to apply Exposure Compensation, which adjusts exposure for the next picture or movie you shoot. A higher value produces a brighter picture. Playback button Toggles picture playback on and off. Delete button While reviewing pictures, press to erase currently displayed or selected photos. Menu button Opens camera menus. Menu items that appear dimmed can’t be adjusted in the current exposure mode. WB/Help/Protect button During shooting, press to access White Balance settings. On any screen that has a question mark in the lower-left corner, press to display an information screen about the current function. During playback, press to toggle file-protection on and off. Qual/Zoom In button During viewfinder photography, press to access the Image Size and Image Quality settings. During Live View shooting and picture playback, press to magnify display. During movie playback, press to increase audio volume. 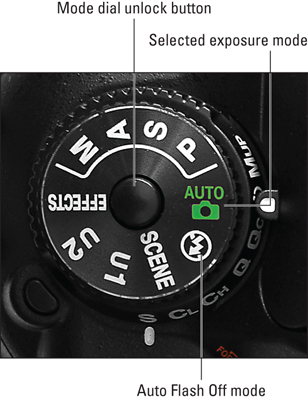 Metering Mode/Zoom Out/Thumbnail Button During viewfinder photography, press to access the Metering Mode setting, which determines how the camera calculates exposure. During Live View shooting, press to reduce on-screen magnification. In Playback mode, press to cycle from full-frame playback to Thumbnail view and then to Calendar view. Info button During viewfinder shooting, turns Information screen on and off. When Live View is engaged, changes the type and amount of data displayed on the monitor. AE-L/AF-L button Interrupts continuous exposure adjustment, locking in the current settings as long as you hold down the button. When you use continuous autofocusing, also locks in current focusing distance. Main command dial Used to adjust a variety of settings, often in combination with pressing a camera button. Focus Selector Lock switch Locks or unlocks autofocus-point selection. Set to the L position to lock in the currently selected point; align with white dot to enable selection of any focus point. Multi-Selector/OK button During shooting, press outer edges up/down/left/right to navigate menus and select camera settings; press OK to lock in your choice of settings. During playback, press up/down to change the playback display mode; press left/right to scroll through pictures. i button Displays i-button menu, a mini-menu that offers quick access to options related to the task at hand (playback, movie shooting, Live View photography, or viewfinder photography). LV switch/button Rotate switch to set the camera to still photography or movie mode. Press the LV button in the center of the switch to turn Live View on and off. Flash button In P, S, A, and M exposure modes, press to use built-in flash. For exposure modes that offer flash, press button while rotating the Main command dial to change the Flash mode. Hold down the button while rotating the Sub-command dial to adjust flash power. BKT button Press to access settings for automatic bracketing of exposure, exposure and flash, Active D-Lighting, or White Balance. Lens-release button Press to disengage lens from camera lens mount so that you can remove the lens. 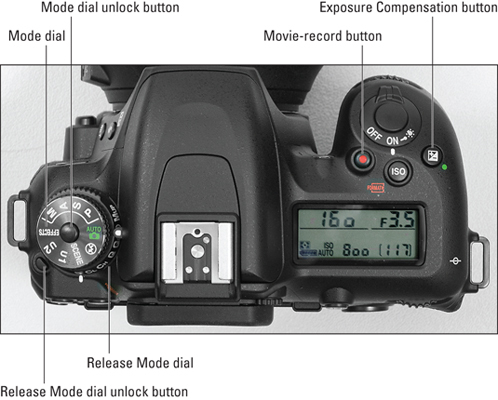 Focus-mode selector Rotate switch to set the camera to automatic (AF) or manual (M) focusing. AF-mode button Press button while rotating the Main command dial to set the Focus mode; press while rotating the Sub-command dial to adjust the AF-area mode. Sub-command dial Used to adjust a variety of settings, often in combination with pressing a camera button. 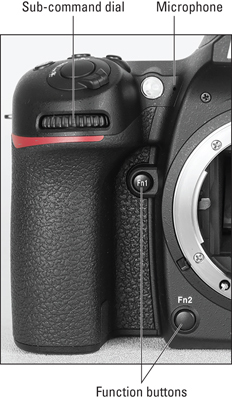 FN1 and F2 buttons During viewfinder photography, press Fn1 to add virtual-horizon display to viewfinder. During viewfinder or Live View photography, press Fn2 while rotating Main command dial to change the Image area setting. During movie shooting, press either button to add an index marker. Both buttons can be programmed to perform other functions through the Custom Control Assignment options on the Custom Setting menu. Your choice of exposure mode determines how much control you have over picture settings, including options that affect exposure, color, and autofocusing features. Set the exposure mode via the Mode dial shown here. For the most control, switch to P, S, A, or M mode. Auto Completely automatic photography; the camera analyzes the scene and tries to choose settings that produce the best results. Auto Flash Off Same as Auto, but with flash disabled. Scene Offers options for capturing specific types of scenes: portraits, landscapes, sports photos, and so on. U1 and U2 Custom user modes that you create, storing all the settings you like to use for a particular shooting situation. Effects Enables you to add special effects to pictures and movies as you shoot them. P (Programmed Autoexposure) Camera selects both the f-stop and shutter speed to ensure proper exposure, but you can choose from multiple combinations of the two settings. S (Shutter-priority Autoexposure) You set shutter speed, and the camera selects the f-stop that will produce a good exposure. A (Aperture-priority Autoexposure) You select f-stop, and the camera selects the shutter speed that will produce a good exposure. M (Manual Exposure) You control both the shutter speed and f-stop.